The increasing user-friendliness of cloud computing is making it more accessible to users as they better understand its capabilities and realize how easy and affordable it can be. As cloud infrastructure has started offering a wider range of storage functionality, IT professionals are finding that they can make use of the benefits it provides both operationally and financially. But achieving this optimum result is neither easy nor prevalent; awareness of the upside can sometimes blind prospective users to the potholes and blind curves on the road to cloud storage bliss. 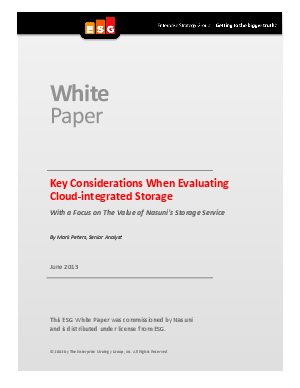 This paper assumes at least a general awareness of the methods and advantages of cloud storage, and perhaps even an acknowledgement that it is a natural infrastructure development, and is therefore designed to provide pragmatic advice to help with specific deployment choices.